joy magnetism: Tear down that wall! Like I said, yay for theme week! 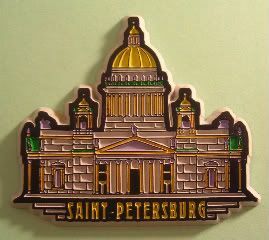 Today's city is Saint Petersburg, Russia. This is one of those places that I've always wanted to visit - especially during the great Monet search. I was convinced the Hermitage must have had it, a leftover spoils of whichever wars. I've always been interested in going to Russia, but never made it over. Is it odd that some of it stems from being part of the cold war generation? It sounds a little xenophobic, I know, but you have to remember, I was an impressionable eight/nine years old when people were literally shouting their rhetoric on television. In fact, I distinctly remember in second grade our Weekly Readers had a picture of Soviets in Afghanistan. Looking back, I really wonder if that's a false memory, because man, if that was what they were showing second graders back then, what *must* they be showing them now. But, I do remember stories of the $50 Levis, and how cold Russia was (or maybe I just thought that cuz it was called the Cold War? ), and how supplies were scarce and people were scared over there. Helloooo, propaganda! I would totally go now, but will probably have to wait a few more years before getting up the scratch to visit. The funny part, is that I do remember it being a huge deal when one of my classmates going to visit. He's not the one that brought back this magnet. This one comes from another friend who went to visit in the last few years. Here's what I love about magnets. Wherever you go around the world - whatever of the magnetblog links (over to the right) that you click on - magnets are generally made out of the same materials. Resin, rubber, plastic, metal, etc. And mostly with the same designs. I love that these kinds of magnets exist a world away. This magnet, from what I can gather is of the Isaakevsky Sobor (St. Isaac's Cathedral). I read somewhere that at the time it was built, it was the largest church in Russia, and even now, it's something like 3rd largest domed church in the world. It's pretty massive - the base alone took five years to build! And from the pictures, it's gorgeous inside as well. I love that Nicholas I supposed rejected proposals to build actual ports for his people, saying they needed it for this Cathedral. Of course, now it's a state museum, which they deemed ok, because now it serves not only their religious souls, but their social ones, as well. Though, check out the link on the side that says, "History of Creation." Hee. Nah, they just mean creation of the church. Heh. Anyway, pretty cool, huh. It's kinda awesome how mankind shares a common thread, needing to build massive places of worship for whatever god they're worshipping. But, I guess that's another magnet altogether. ochen haresho! very good! (it looks better in russian. i want to go to russia... maybe after i learn some real russian. anyway, i miss those weekly readers. it's kinda like the paper that i read in the morning... but weekly reader is more intersting.